A sporty RS version rocks the Miami show in vivid green and black graphics. 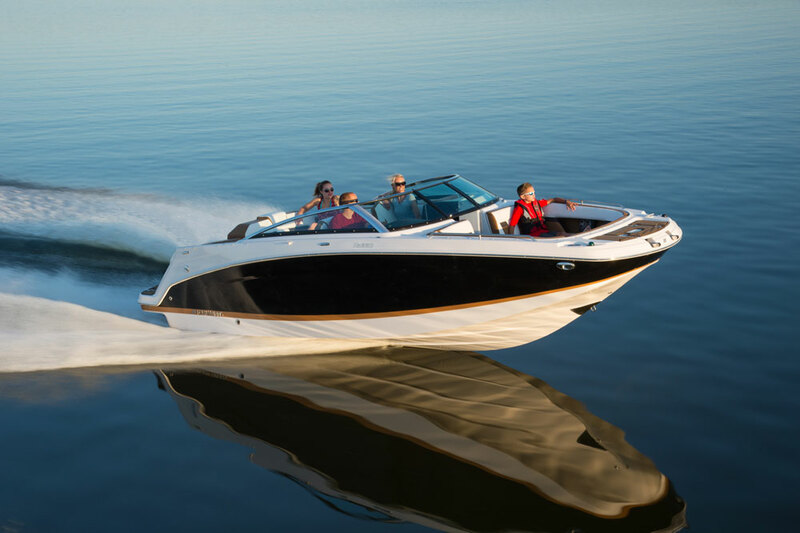 Four Winns added another model to its line of Sundowner cuddy-cabin boats with the debut at the Miami International Boat Show of the Sundowner 265RS, a 26-foot model with the lines of an express cruiser and a modest mid-cabin stowage area. 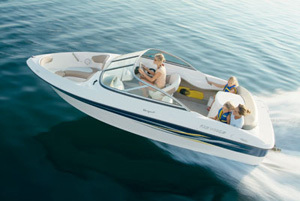 The Four Winns Sundowner 265RS makes a solid play for the cuddy-cabin market. It's sporty looking, practical, and still trailerable. In a boat this size – the beam is 8 feet, 5 inches – Four Winns is able to offer a cabin that’s more than just a stowage area. The Sundowner 265 cabin has an enclosed head with standard porta-potti, a full V-berth and a modest galley that Four Winns calls a “breakfast center.” I could see a couple overnighting while beached at a remote sandbar on this boat. The roll-down tambour door to the cabin is a space-saving feature carried over from smaller Sundowner models. There’s a mid-cabin cubby that extends below the cockpit deck but it’s intended for stowage rather than as berth space. It’s perfect for stashing sleeping bags and pillows. 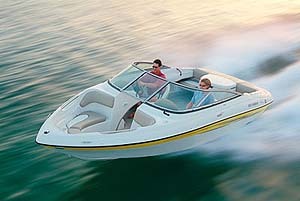 The cockpit is more typical runabout fare, with ComfortRide bucket seats at the helm and a wraparound bench seat aft. A four-speaker Sony audio system with MP3 is standard, as is a bimini top and a flip-up walk-through to the swim platform. The boat at the Miami show was decked out in the dramatic RS package (there’s also a Sundowner 265 and Sundowner 265SS in less flamboyant trim), which is highlighted by green and black graphics on the hull sides, and green and black highlights in the interior. This is the first time I’ve seen the green color in person, and it’s not as intense as it may appear in photos – think 70s muscle car, not Kawasaki motorcycle. The “carbon texture” vinyl has a sort of shimmering appearance. This is a well-appointed boat that’s nicely finished. 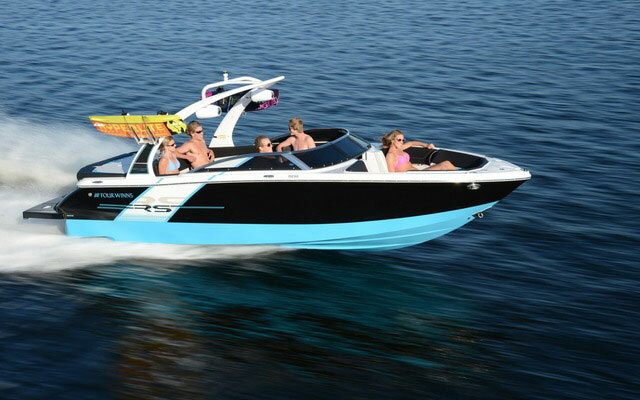 The example at the Miami show was heavily optioned and had an MSRP of $86,000 with a 320-hp MerCruiser and a trailer. 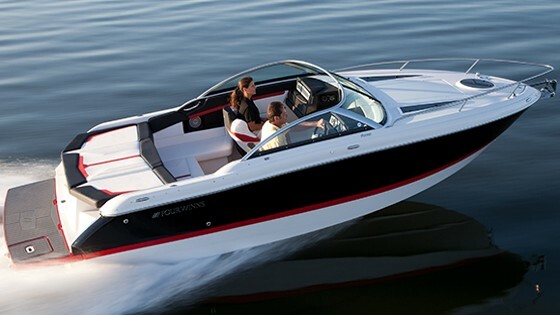 Max power is 380 horsepower from MerCruiser or Volvo Penta. I agree with Four Winns. I think more buyers are going to start turning to cuddy-cabin boats, a style that fell out of favor during the go-go economy but makes more sense now in a more practical era. Four Winns is out front in this trend. For more info, visit Four Winns. 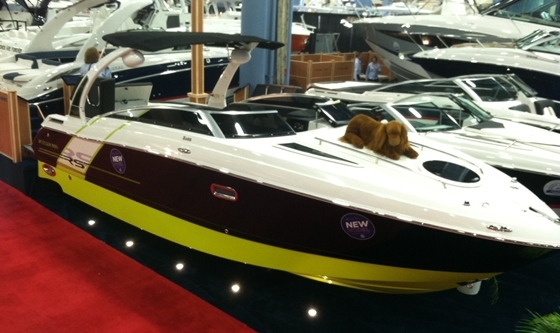 Don’t miss any aspect of the 2013 Miami International Boat Show — whether you’re at the event or checking in from afar. 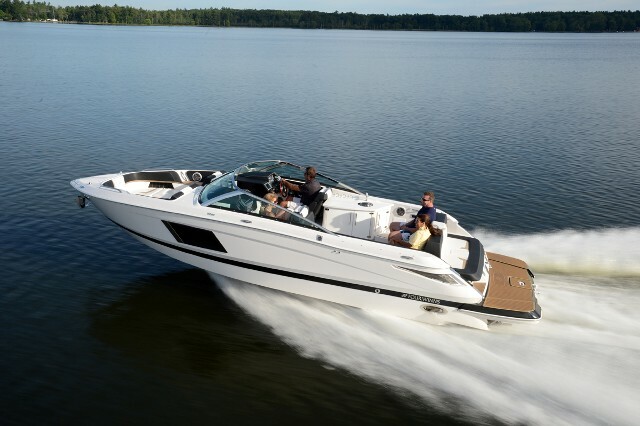 Join the conversation on Twitter by using #boatsdotcom. If you’re taking pictures at the show, we’d love to share them on our Pinterest boards! Create an MIB board on Pinterest and tag us in your captions.